Henry Ford Cancer Institute is the first in Michigan to offer a needle-free, patient-controlled tissue expansion system for women undergoing breast reconstruction after mastectomy. The FDA-approved AeroForm Tissue Expanders eliminate the need for weekly saline injections at the physician’s office, improves patient comfort and may decrease the rate of expander infection. Instead, the system fills temporary implants with small doses of carbon dioxide triggered by a “medical wand” that patients can control at their own rate and comfort. Jessica Linders is a Henry Ford breast cancer patient who used the AeroForm Tissue Expanders. 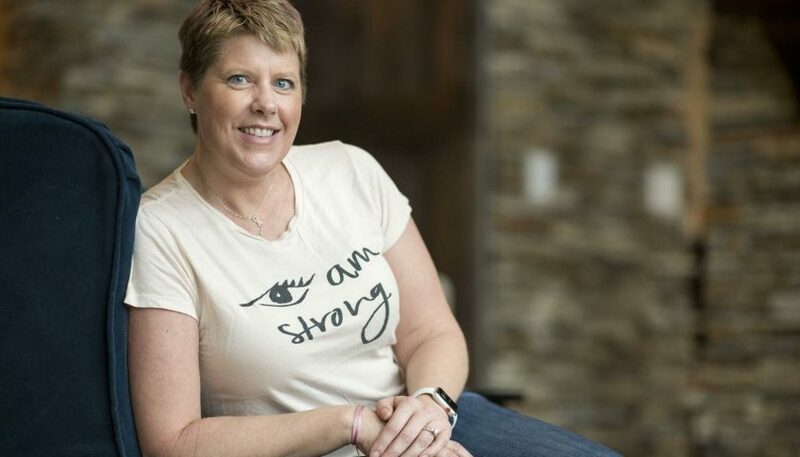 Because Linders had a genetic mutation, known as BRCA2, she decided to have a double mastectomy after she was diagnosed with an invasive and aggressive lobular breast cancer that had metastasized to the lymph nodes in her armpit. She is one of more than 100,000 women each year in the U.S. who have surgery to remove one or both cancerous breasts. Like 42 percent of women, Linders opted for reconstructive surgery after mastectomy—a process that often starts immediately at the time that the breast is removed. In her case, a temporary expander was inserted under the chest muscle to stretch the skin and the muscle in preparation for an eventual permanent implant. Traditionally, to stretch the tissue, patients would need to visit the plastic surgeon’s office for weekly fills with saline injections. In Linders’s case, AeroForm Tissue Expanders gave her control of her expansion process under the direction of her physician. There were no injections, no large weekly boluses of fluid, minimal pain, and decreased visits to the plastic surgeon’s office. In addition to anxiety related to enlarging a recent surgical site, painful cramps may occur when chest tissue is expanded quickly by saline injections. “It can feel torturous if a doctor gives 75 cc’s or more of saline during one office visit. And the sensitive area can remain painful and tight for 48-72 hours,” says Dunya Atisha, M.D., director, of Breast Reconstruction and Microsurgery at Henry Ford. But if the patient controls the process, it is less painful, she says. The woman regulates how much air is used and on what days it is used. Patients can pump themselves up a little each day, or they can take a break for a day or two. When Dr. Atisha explained how the new air-expander technology worked and compared it with saline expanders, Linders chose the air expander. “It was a done deal. Just knowing I didn’t have to have another needle stuck in my chest helped me make the decision,” says Linders. The concept of using expansion devices which did not require injections into a tissue expander was generated by a Silicon Valley plastic surgeon. Dr. Dan Jacob was concerned about his cancer patients who required needle injections to fill their saline expanders. “This technology revolutionizes the expansion process,” says Dr. Atisha. “The needle-free alternative is the first major change in breast tissue expansion in more than 40 years. This new system is the future of our field. It offers patients enhanced comfort and convenience, and it also provides women with a sense of control as they navigate their recovery from breast cancer. Results from the XPAND clinical trial show that patients using the AeroForm device completed tissue expansion in a median of 21 days, compared to a median of 46 days for patients undergoing saline expansion. Also, women who used the AeroForm device progressed to breast implantation one month faster on average than the saline group. However, expansion varies depending on the size of the woman, the amount of volume needed and the patient’s comfort level. “Everyone’s experience is different and the time it takes someone to get to their goal varies,” says Dr. Atisha. To gradually stretch the skin on the chest wall using AeroForm Tissue Expanders, the woman holds a wireless device near her chest, and she presses a button to activate electronics inside the temporary implant. From a reservoir in the implant, compressed carbon dioxide is gradually released in small amounts into the expander. The process can be repeated three times a day. “I’ve been 98 percent satisfied,” she says. The only downside was that a small amount of air was released each day, but it wasn’t a significant reduction. The released carbon dioxide is not harmful. Carbon dioxide is actually a byproduct of what we exhale with every breath, says Dr. Atisha. Linders used the AeroForm AirXpanders to stretch the skin on her chest for four weeks, and then the expansion process was complete. After chest expansion, the average patient will keep the expander implants in place for 2-3 months from says Dr. Atisha. However, patients who need chemotherapy and radiation will retain the implants for 9-12 months.